Congratulations to the Univerisity of California, Irvine, on its selection as the 2014 “Greenest School in the Nation,” according to the Sierra Club’s magazine. The Sierra Club is the nation’s largest and oldest environmental organization. 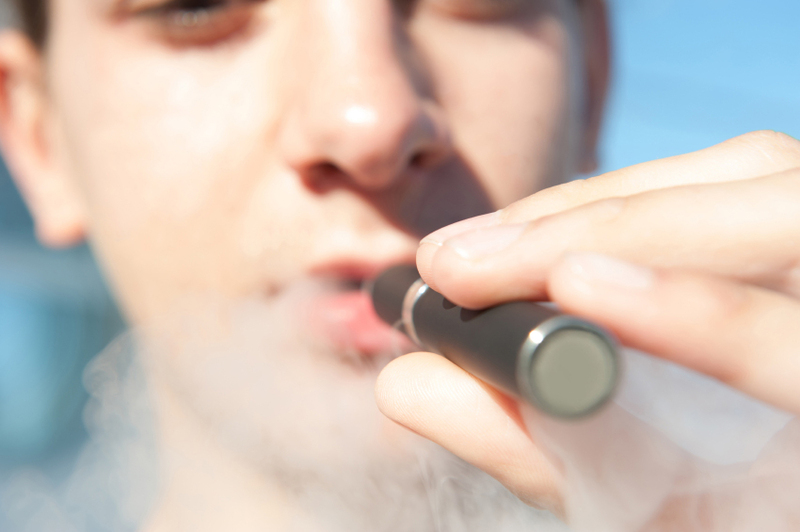 The decision was based on a survey of America’s four-year degree-granting undergraduate colleges conducted by four organizations: the Sierra Club, the Association for the Advancement of Sustainability in Higher Education (AASHE), the Sustainable Endowments Institute (SEI), and the Princeton Review. UCI came in first out of the 173 colleges that completed the survey by scoring 813.51 out of a possible total of 1000 points. 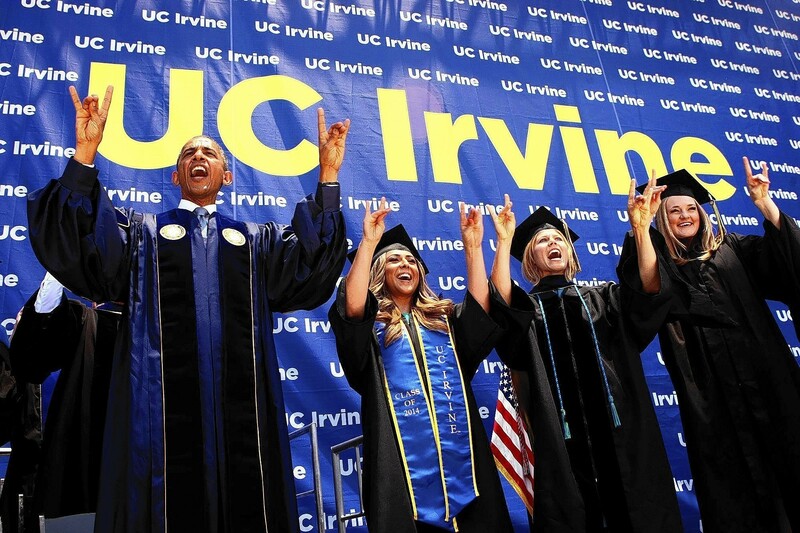 The City of Irvine has a lot to learn from UC Irvine’s accomplishments. The City of Irvine ought to be a leader in creating sustainable communities that incorporate smart growth principles, public transit and active transportation access to work, parks, shopping and recreation. Our heritage as a master planned community and our long-standing commitment to well-planned smart growth ought to make Irvine a natural leader in promoting green building practices and smart growth principles. Unfortunately, in recent years we have set our environmental goals too low. Nor is the current council majority committed to smart, green growth, instead approving frantic growth and development at any cost. The result of the current council’s rubber-stamping of developers’ proposals has been runaway development of housing tracts and apartments causing terrible traffic and overcrowded schools – posing a clear and present danger to our quality of life. 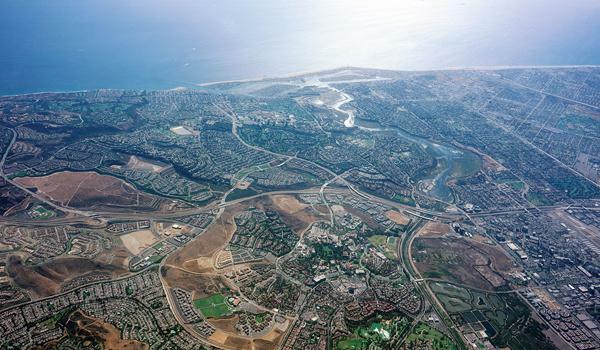 Irvine is positioned to become a leader in renewable energy use. Last year, the Solar Decathlon was held for first time outside of Washington, D.C. – at the Great Park, in Irvine. Despite a lukewarm, anti-environmentally conscious majority on the city council, the event was successful. 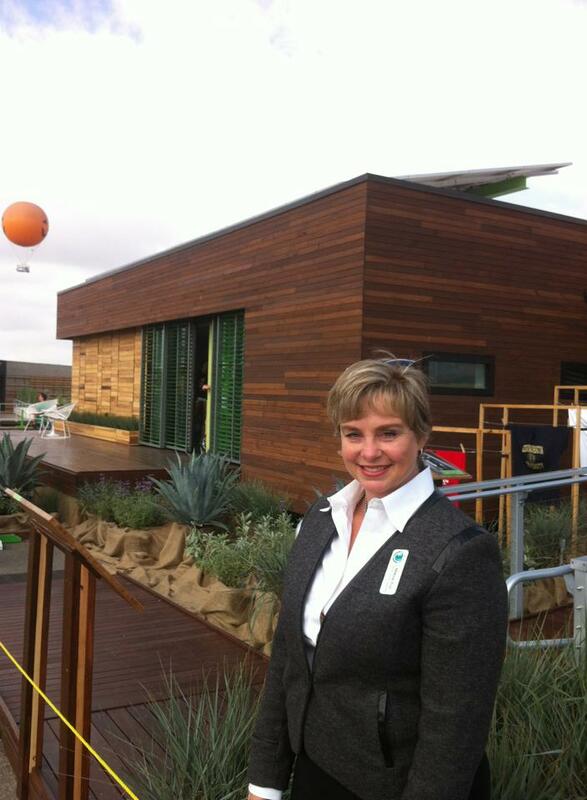 The 2015 Solar Decathlon will be held once again here in Irvine. And a team from Orange County, led by UC Irvine, will be in the competition. This time, with an enthusiastic and committed city council and thoughtful promotion and planning, the event could have much more wide-ranging and economically beneficial impact for the city. 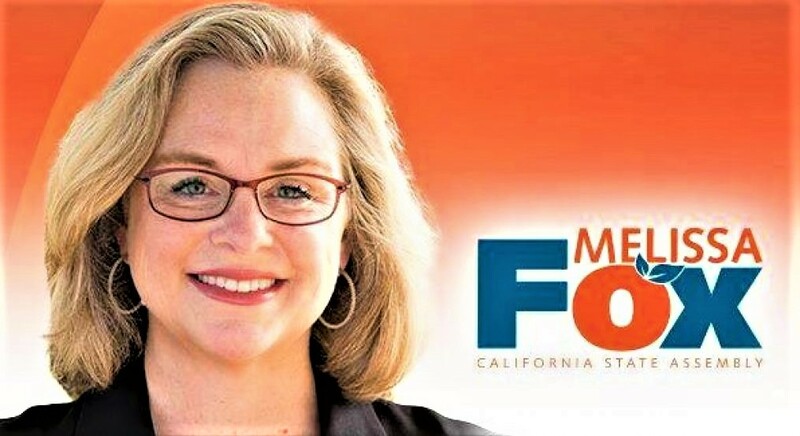 But before that can happen – and before Irvine can claim the title of the nation’s energy innovation capitol – we must elect a city council committed to making solar and renewable energy a far more significant energy source for Irvine’s city buildings, homes and businesses. 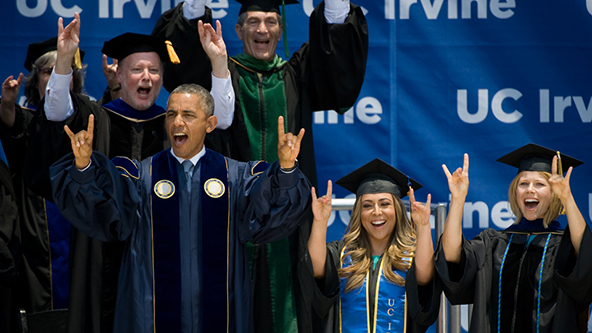 So congratulations UC Irvine! You’ve shown us the direction that the City of Irvine should be taking. “And I’m here to tell you, don’t believe the cynicism. Guard against it. Don’t buy into it. Today, I want to use one case study to show you that progress is possible and perseverance is critical. 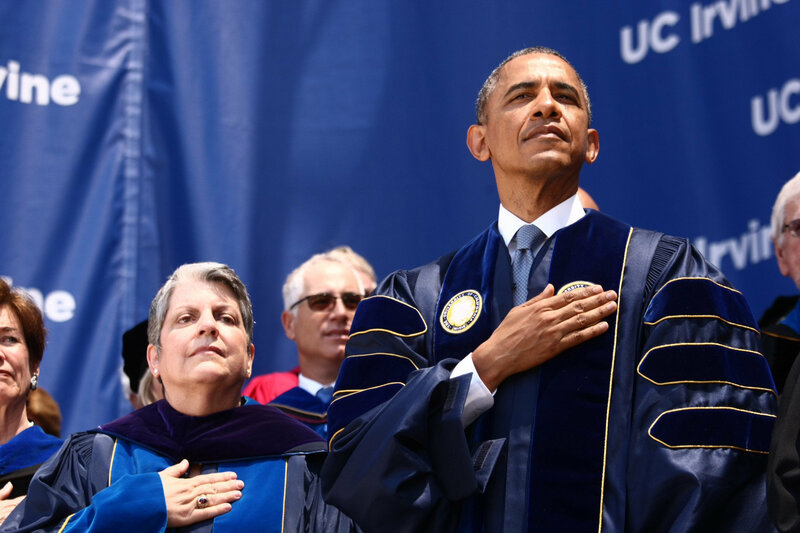 I want to show you how badly we need you — both your individual voices and your collective efforts — to give you the chance you seek to change the world, and maybe even save it.” — President Barack Obama, UC Irvine Graduation, 2014. It is worth repeating his words here, and worth committing ourselves to use more clean energy and waste less energy overall. 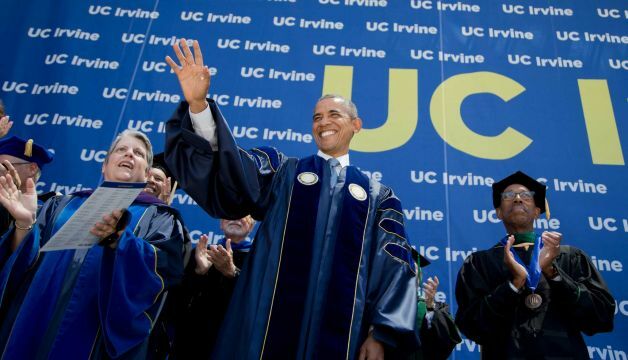 It is also especially significant that President Obama chose to address our energy future at a graduation for UC Irvine — the home campus of the 2015 Solar Decathlon, the international competition — to be held at the Great Park in Irvine — that challenges collegiate teams to design, build, and operate solar-powered houses that are cost-effective, energy-efficient, and attractive. 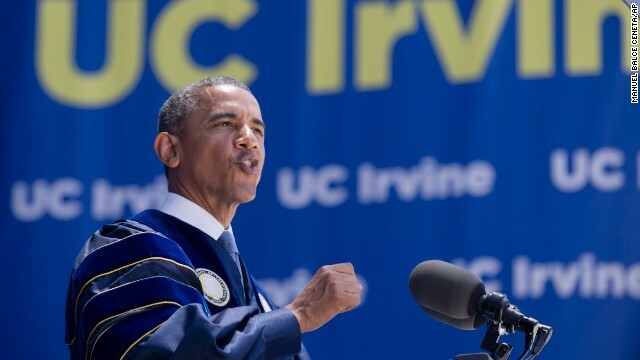 The president’s speech highlighted the fact that our City of Irvine is poised to become an international leader in the science, engineering, and entrepreneurship of energy innovation and new, clean sources of power. THE PRESIDENT: Thank you. (Applause.) Hello, Anteaters! (Applause.) That is something I never thought I’d say. (Laughter.) Please, please take a seat. Now, in additional to Ferial, graduates, I’m here for a simple reason: You asked. 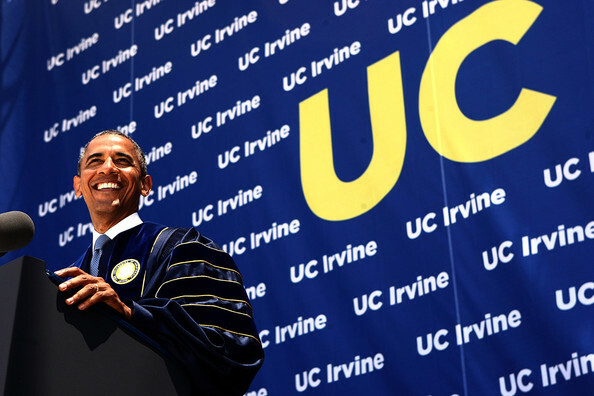 For those who don’t know, the UC Irvine community sent 10,000 postcards to the White House asking me to come speak today. (Applause.) Some tried to guilt me into coming. I got one that said, “I went to your first inauguration, can you please come to my graduation?” (Applause.) Some tried bribery: “I’ll support the Chicago Bulls.” Another said today would be your birthday — so happy birthday, whoever you are. “We are super underrated.” This young lady could have just as well been talking, though, about this generation. I think this generation of young people is super underrated. In your young lives, you’ve seen dizzying change, from terror attacks to economic turmoil; from Twitter to Tumblr. Some of your families have known tough times during the course of the worst economic crisis since the Great Depression. You’re graduating into a still-healing job market, and some of you are carrying student loan debt that you’re concerned about. And yet, your generation — the most educated, the most diverse, the most tolerant, the most politically independent and the most digitally fluent in our history — is also on record as being the most optimistic about our future. And I’m here to tell you that you are right to be optimistic. (Applause.) You are right to be optimistic. Consider this: Since the time most of you graduated from high school, fewer Americans are at war. More have health insurance. More are graduating from college. Our businesses have added more than 9 million new jobs. The number of states where you’re free to marry who you love has more than doubled. (Applause.) And that’s just some of the progress that you’ve seen while you’ve been studying here at UC Irvine. But we do face real challenges: Rebuilding the middle class and reversing inequality’s rise. Reining in college costs. Protecting voting rights. Welcoming the immigrants and young dreamers who keep this country vibrant. Stemming the tide of violence that guns inflict on our schools. We’ve got some big challenges. And if you’re fed a steady diet of cynicism that says nobody is trustworthy and nothing works, and there’s no way we can actually address these problems, then the temptation is too just go it alone, to look after yourself and not participate in the larger project of achieving our best vision of America. And I’m here to tell you, don’t believe the cynicism. Guard against it. Don’t buy into it. Today, I want to use one case study to show you that progress is possible and perseverance is critical. I want to show you how badly we need you — both your individual voices and your collective efforts — to give you the chance you seek to change the world, and maybe even save it. I’m going to talk about one of the most significant long-term challenges that our country and our planet faces: the growing threat of a rapidly changing climate. Now, this isn’t a policy speech. 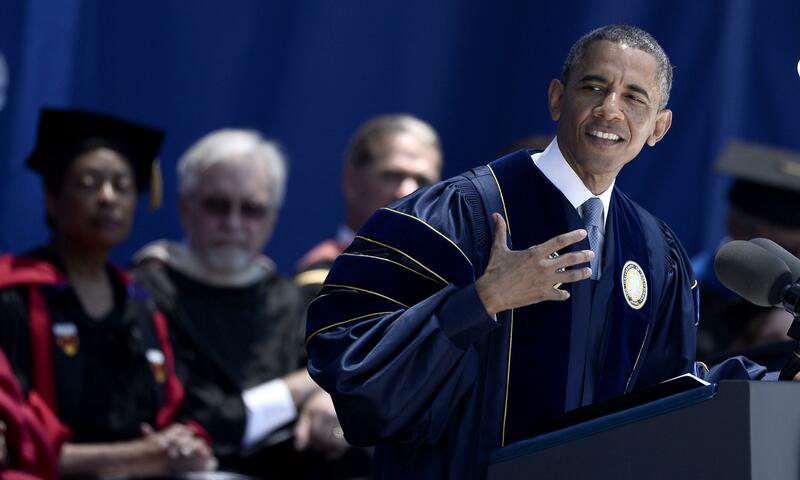 I understand it’s a commencement, and I already delivered a long climate address last summer. I remember because it was 95 degrees and my staff had me do it outside, and I was pouring with sweat — as a visual aid. (Laughter.) And since this is a very educated group, you already know the science. Burning fossil fuels release carbon dioxide. Carbon dioxide traps heat. Levels of carbon dioxide in our atmosphere are higher than they’ve been in 800,000 years. We know the trends. The 18 warmest years on record have all happened since you graduates were born. We know what we see with our own eyes. Out West, firefighters brave longer, harsher wildfire seasons; states have to budget for that. Mountain towns worry about what smaller snowpacks mean for tourism. Farmers and families at the bottom worry about what it will mean for their water. In cities like Norfolk and Miami, streets now flood frequently at high tide. Shrinking icecaps have National Geographic making the biggest change in its atlas since the Soviet Union broke apart. So the question is not whether we need to act. The overwhelming judgment of science, accumulated and measured and reviewed over decades, has put that question to rest. The question is whether we have the will to act before it’s too late. For if we fail to protect the world we leave not just to my children, but to your children and your children’s children, we will fail one of our primary reasons for being on this world in the first place. And that is to leave the world a little bit better for the next generation. Now, the good news is you already know all this. UC Irvine set up the first Earth System Science Department in America. (Applause.) A UC Irvine professor-student team won the Nobel Prize for discovering that CFCs destroy the ozone layer. (Applause.) A UC Irvine glaciologist’s work led to one of last month’s report showing one of the world’s major ice sheets in irreversible retreat. Students and professors are in the field working to predict changing weather patterns, fire seasons, and water tables — working to understand how shifting seasons affect global ecosystems; to get zero-emission vehicles on the road faster; to help coastal communities adapt to rising seas. And when I challenge colleges to reduce their energy use to 20 percent by 2020, UC Irvine went ahead and did it last year. Done. (Applause.) 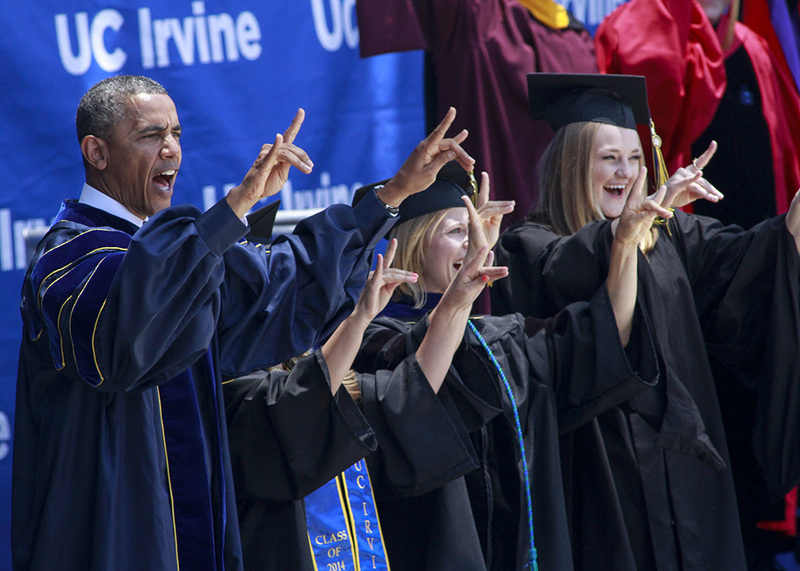 So UC Irvine is ahead of the curve. All of you are ahead of the curve. Your generation reminds me of something President Wilson once said. He said, “Sometimes people call me an idealist. Well, that is the way I know I am an American.” That’s who we are. And if you need a reason to be optimistic about our future, then look around this stadium. Because today, in America, the largest single age group is 22 years ago. And you are going to do great things. And I want you to know that I’ve got your back — because one of the reasons I ran for this office was because I believed our dangerous addiction to foreign oil left our economy at risk and our planet in peril. So when I took office, we set out to use more clean energy and less dirty energy, and waste less energy overall. The fact is, this should not be a partisan issue. After all, it was Republicans who used to lead the way on new ideas to protect our environment. It was Teddy Roosevelt who first pushed for our magnificent national parks. It was Richard Nixon who signed the Clean Air Act and opened the EPA. George H.W. Bush — a wonderful man who at 90 just jumped out of a plane in a parachute — (laughter) — said that “human activities are changing the atmosphere in unexpected and unprecedented ways.” John McCain and other Republicans publicly supported free market-based cap-and-trade bills to slow carbon pollution just a few years ago — before the Tea Party decided it was a massive threat to freedom and liberty. And part of the challenge is that the media doesn’t spend a lot of time covering climate change and letting average Americans know how it could impact our future. Now, the broadcast networks’ nightly newscasts spend just a few minutes a month covering climate issues. On cable, the debate is usually between political pundits, not scientists. When we introduced those new anti-pollution standards a couple weeks ago, the instant reaction from the Washington’s political press wasn’t about what it would mean for our planet; it was what would it mean for an election six months from now. And that kind of misses the point. Of course, they’re not scientists, either. And I want to tell you all this not to discourage you. I’m telling you all this because I want to light a fire under you. As the generation getting shortchanged by inaction on this issue, I want all of you to understand you cannot accept that this is the way it has to be. Developing countries are using more and more energy, and tens of millions of people are entering the global middle class, and they want to buy cars and refrigerators. So if we don’t deal with this problem soon, we’re going to be overwhelmed. These nations have some of the fastest-rising levels of carbon pollution. They’re going to have to take action to meet this challenge. They’re more vulnerable to the effects of climate change than we are. They’ve got even more to lose. But they’re waiting to see what does America do. That’s what the world does. It waits to watch us act. And when we do, they move. And I’m convinced that on this issue, when America proves what’s possible, then they’re going to join us. And America cannot meet this threat alone. Of course, the world cannot meet it without America. This is a fight that America must lead. So I’m going to keep doing my part for as long as I hold this office and as long as I’m a citizen once out of office. But we’re going to need you, the next generation, to finish the job. We need scientists to design new fuels. We need farmers to help grow them. We need engineers to invent new technologies. We need entrepreneurs to sell those technologies. (Applause.) We need workers to operate assembly lines that hum with high-tech, zero-carbon components. We need builders to hammer into place the foundations for a clean energy age. We need diplomats and businessmen and women, and Peace Corps volunteers to help developing nations skip past the dirty phase of development and transition to sustainable sources of energy. In other words, we need you. (Applause.) We need you. And if you believe, like I do, that something has to be done on this, then you’re going to have to speak out. You’re going to have to learn more about these issues. Even if you’re not like Jessica and an expert, you’re going to have to work on this. You’re going to have to push those of us in power to do what this American moment demands. You’ve got to educate your classmates, and colleagues, and family members and fellow citizens, and tell them what’s at stake. You’ve got to push back against the misinformation, and speak out for facts, and organize others around your vision for the future. You need to invest in what helps, and divest from what harms. And you’ve got to remind everyone who represents you, at every level of government, that doing something about climate change is a prerequisite for your vote. It’s no accident that when President Kennedy needed to convince the nation that sending Americans into space was a worthy goal, he went to a university. That’s where he started. Because a challenge as big as that, as costly as that, as difficult as that, requires a spirit of youth. It requires a spirit of adventure; a willingness to take risks. It requires optimism. It requires hope. That day, a man told us we’d go to the moon within a decade. And despite all the naysayers, somehow we knew as a nation that we’d build a spaceship and we’d meet that goal. That’s because we’re Americans — and that’s what we do. Even when our political system is consumed by small things, we are a people called to do big things. And progress on climate change is a big thing. Progress won’t always be flashy; it will be measured in disasters averted, and lives saved, and a planet preserved — and days just like this one, 20 years from now, and 50 years from now, and 100 years from now. But can you imagine a more worthy goal — a more worthy legacy — than protecting the world we leave to our children? So I ask your generation to help leave us that legacy. I ask you to believe in yourselves and in one another, and above all, when life gets you down or somebody tells you you can’t do something, to believe in something better. There are people here who know what it means to dream. When Mohamad Abedi was a boy, the suffering he saw in refugee camps in Lebanon didn’t drive him into despair — it inspired him to become a doctor. And when he came to America, he discovered a passion for engineering. 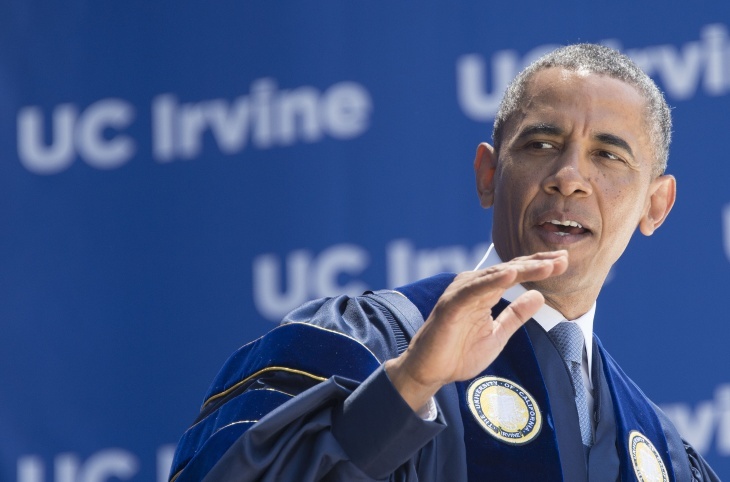 So here, at UC Irvine, he became a biomedical engineer to study the human brain. (Applause.) And Mohamad said, “Had I never come to the United States, I would have never had the ability to do the work that I’m doing.” He’s now going to CalTech to keep doing that work. The point is, you know how to dream. And you know how to work for your dreams. And, yes, sometimes you may be “super underrated.” But usually it’s the underrated, the underdogs, the dreamers, the idealists, the fighters, the argumentative — those are the folks who do the biggest things. And this generation — this 9/11 generation of soldiers; this new generation of scientists and advocates and entrepreneurs and altruists — you’re the antidote to cynicism. It doesn’t mean you’re not going to get down sometimes. You will. You’ll know disillusionment. You’ll experience doubt. People will disappoint you by their actions. But that can’t discourage you. Hope is what gave young soldiers the courage to storm a beach and liberate people they never met. Hope is what gave young students the strength to sit in and stand up and march for women’s rights, and civil rights, and voting rights, and gay rights, and immigration rights. Hope is the belief, against all evidence to the contrary, that there are better days ahead, and that together we can build up a middle class, and reshape our immigration system, and shield our children from gun violence, and shelter future generations from the ravages of climate change. Hope is the fact that, today, the single largest age group in America is 22 years old who are all just itching to reshape this country and reshape the world. And I cannot wait to see what you do tomorrow.